Grand Tourer Injection. GTi, for short. If like me, you’re a hot hatchback fan, these three letters are bound to get the blood pumping. 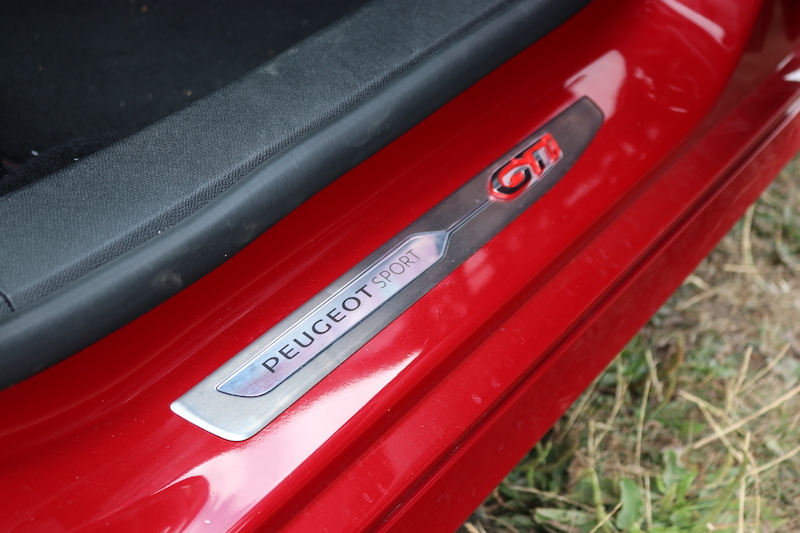 It also brings to mind one of the biggest hot hatch icons, the Peugeot 205 GTi. This is arguably one of the best hot hatches ever to grace the Earth, but that’s in the past. 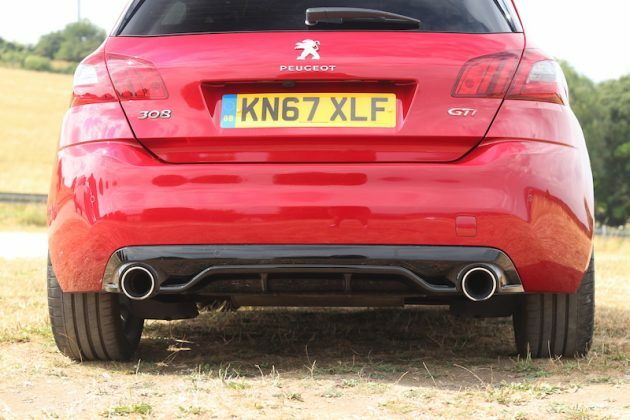 Between then and now, Peugeot hasn’t always got it right in the hot hatch department, but what about this, the 308 GTI? It's not in your face in regards to its styling, but it is rather handsome. I must say I like the contrasting black grile. 19" alloys come as standard. 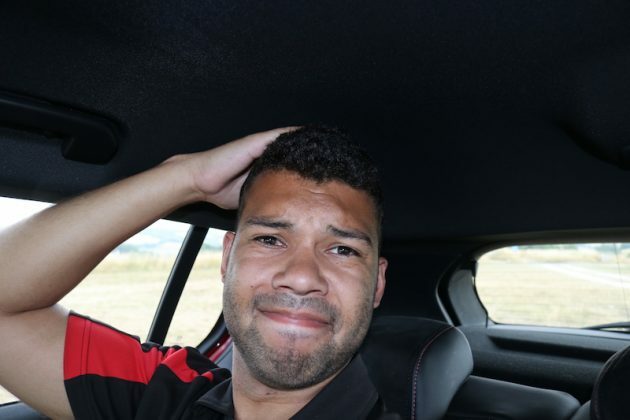 Now, I want to make it clear, I’m not comparing this car to the 205, as that would be unfair. 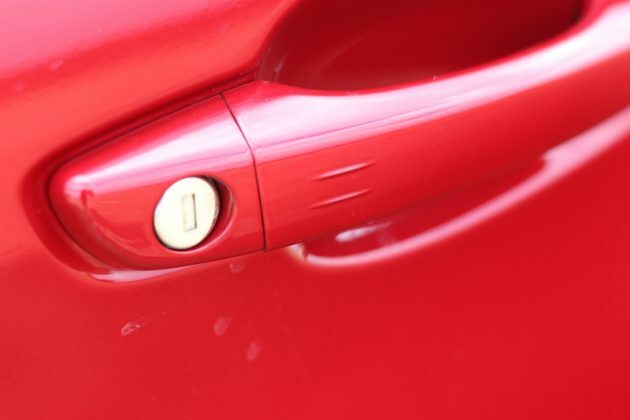 For starters, the 308 is a bigger car, plus is boasts all the safety features and mod cons that we demand nowadays. The reason I mention the 205, is because I want to ask the question, is the 308 GTi a return to form? 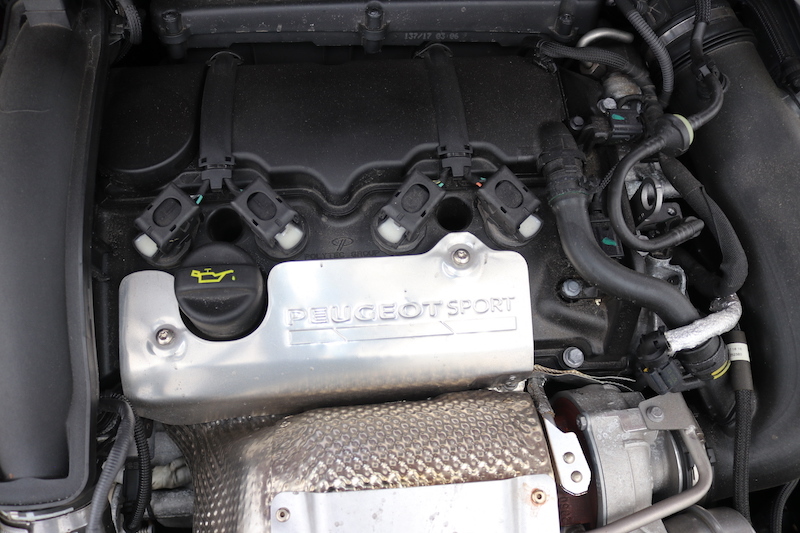 Well, let’s start with the interesting part – the engine. Going in to battle with damp powder? 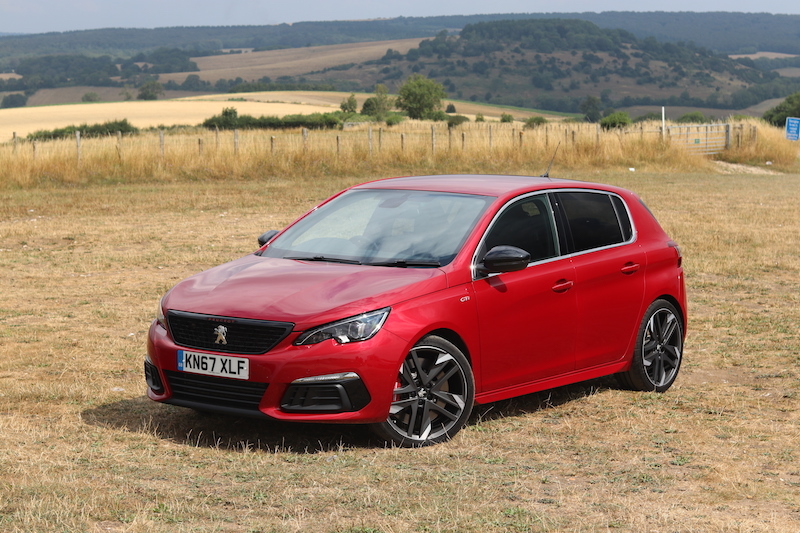 Normally in this class, you’ll find a turbocharged 2.0 litre petrol engine – or a 1.8 litre turbo in the case of the Renault Megane RS – but the 308 GTI has a displacement of just 1.6. Does this mean that it’s behind the competition when it comes to performance? Well actually, it’s more powerful than some of its rivals. This is thanks to a power output of 268bhp and 330Nm of torque. 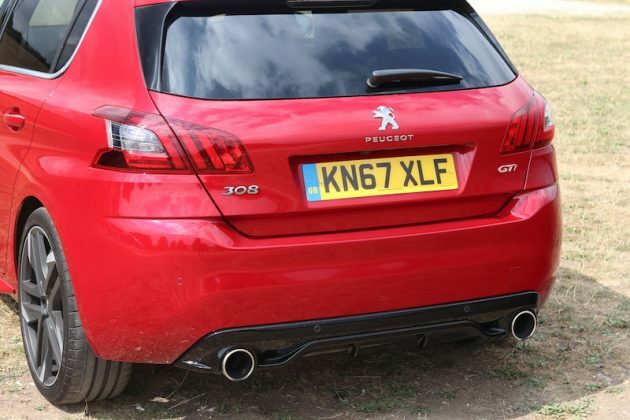 This power is fed through the front wheels via a 6-speed manual gearbox (no auto option), and if you able to peddle the car hard enough, you’ll get this French fancy to 62mph in just 6.0 seconds, which is quicker than a Golf GTI; although it shares the same top speed – 155mph. 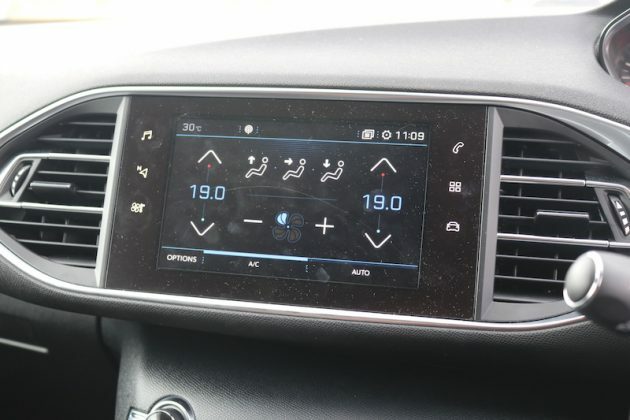 It’s also quicker to 62mph than the i30N Performance, however, it’s not quite as quick as the aforementioned Megane RS or the Leon Cupra 300. 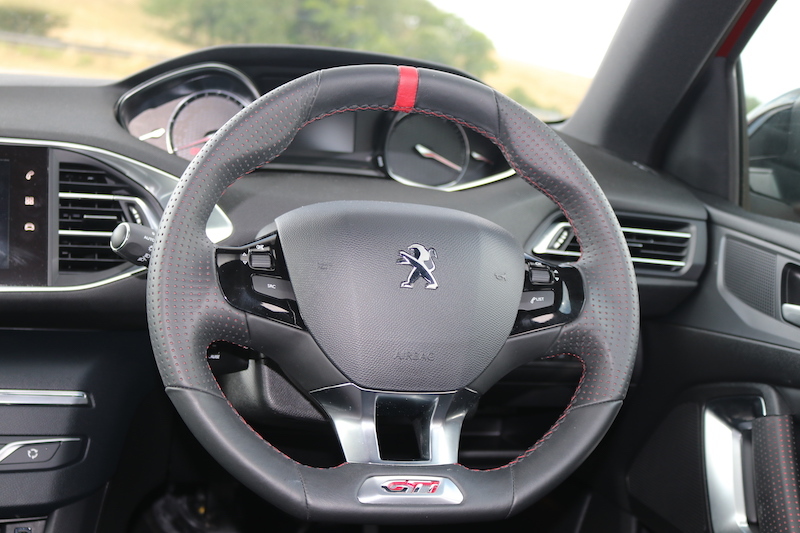 So it seems as if the 308 GTI is quite happy to sit in the middle, but what does the car actually feel like to drive? Is it able to pull at your heart-strings and excite your senses? 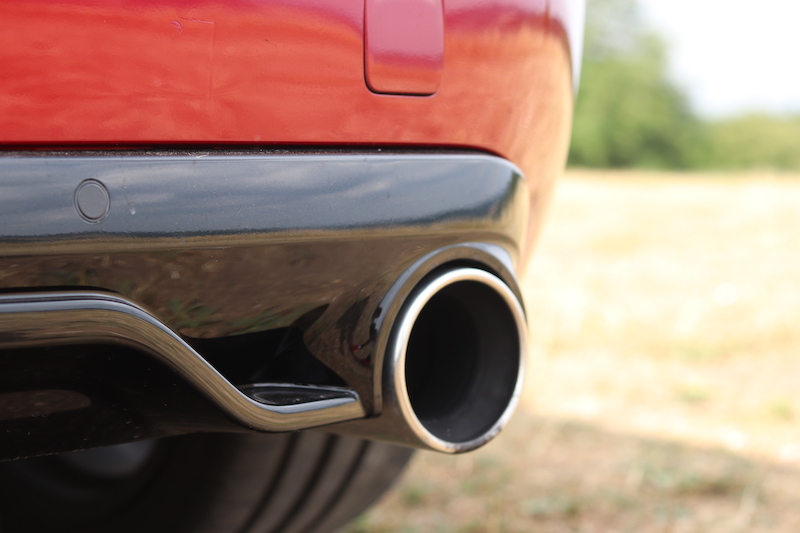 Let me start with how the engine performs, yes it may be the smallest in class, but it really helps to highlight that big things can come in small packages. I’ll admit, there is a bit of turbo lag, but once the engine is on song, you’ll be propelled in to the distance rather quickly. Its delivery is most definitely punchy and the power keeps coming all the way to the redline. 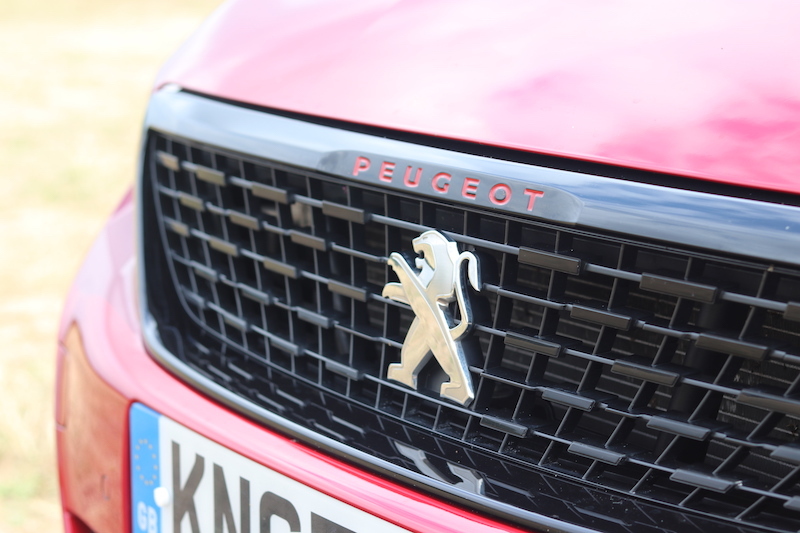 It really is a fiery little engine – I love it. However, it seems to be a bit ashamed of what it is. 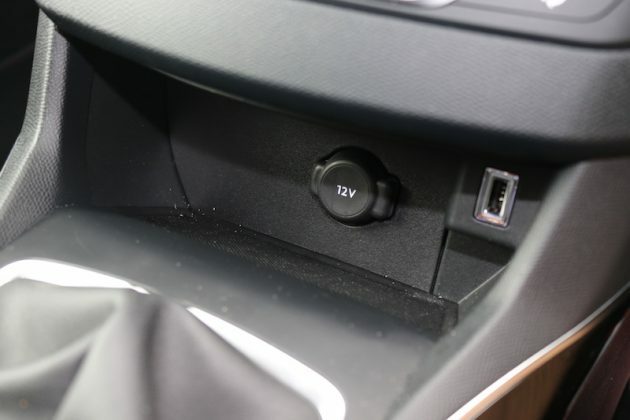 It’s a fairly quiet unit, that doesn’t really start to bellow until you approaching the point when you need to change gear, and that’s great for refinement, but it means it lacks a bit of drama. In fact, this car feels a bit more like a fast GT model – albeit with firm suspension – rather than a red-blooded hot hatch. 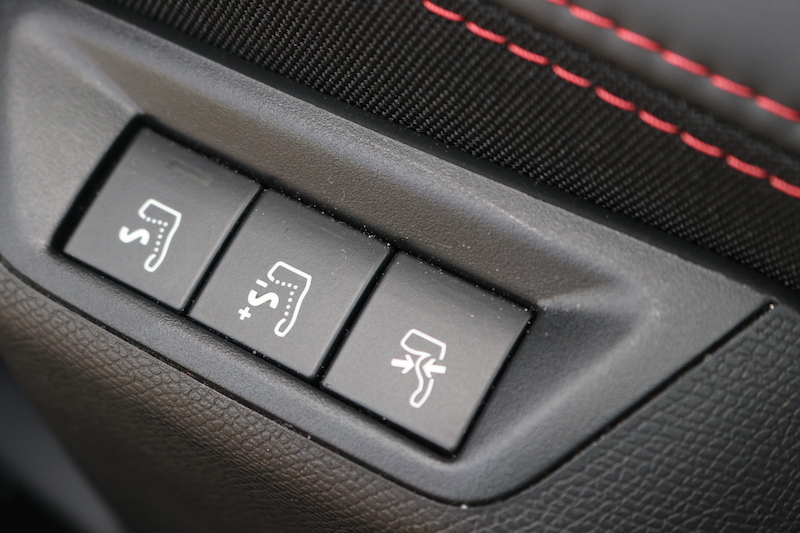 Surely it has a decent manual ‘box though? 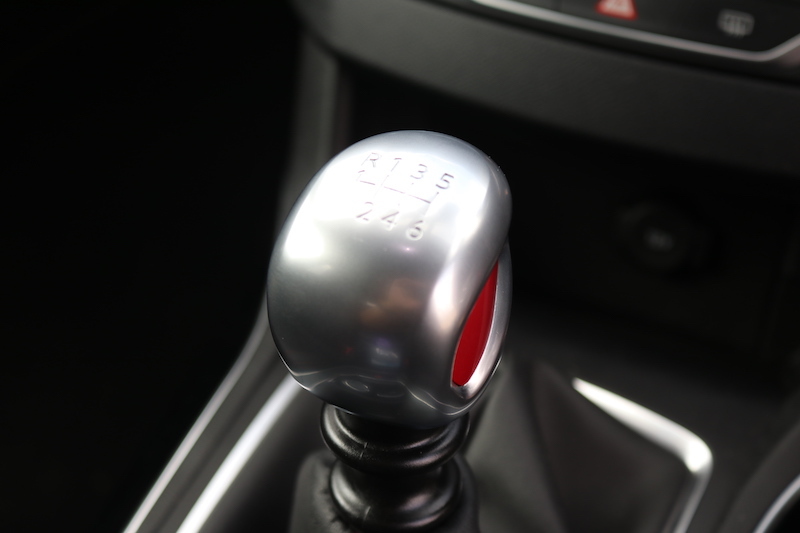 A decent gearhcange is key in a hot hatch, but this 6-speed manual is definitely not the best in the business as the changes are too light for me liking and in my opinion it lacks the precision needed for a car such as this. 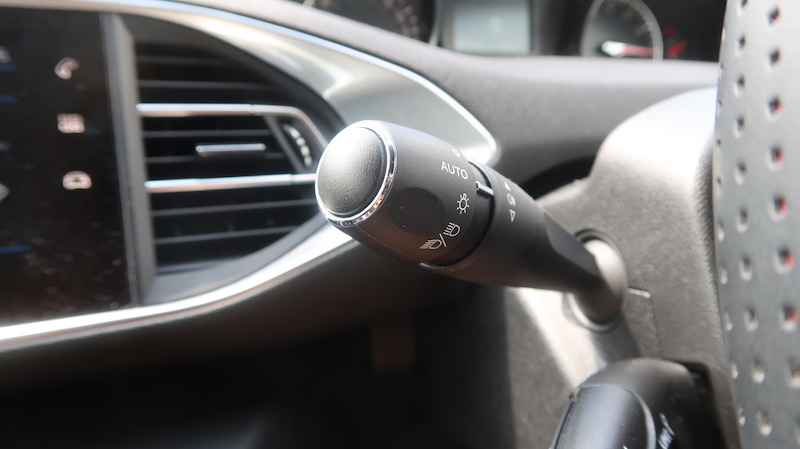 I do rather like the funky design of the gear lever, though. It’s a rather swanky looking gear lever, but I wish it was more enjoyable to use. 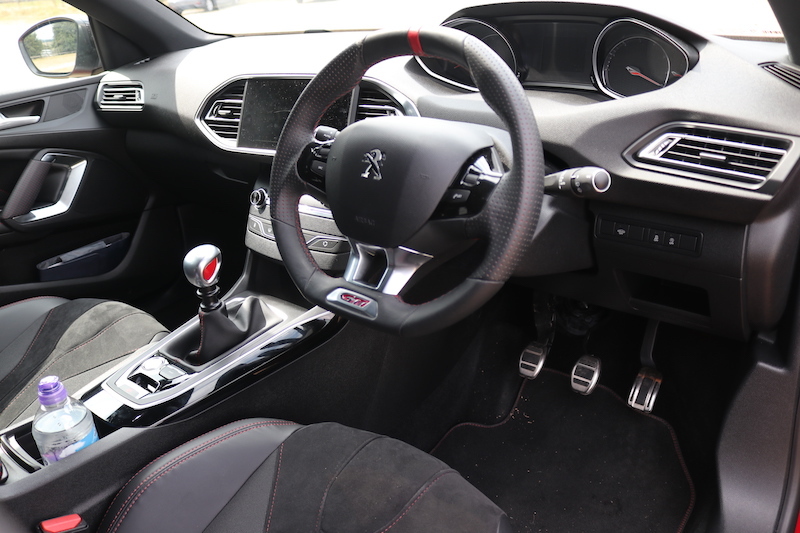 The driving position takes a bit of getting used to as the seat is set a bit too high for my liking, and you’ve got a steering wheel that’s about the same size as a side plate. As with other Peugeot models, you get a small steering wheel, which looks like it’d be more at home in a go-kart rather than a medium-sized hatchback. 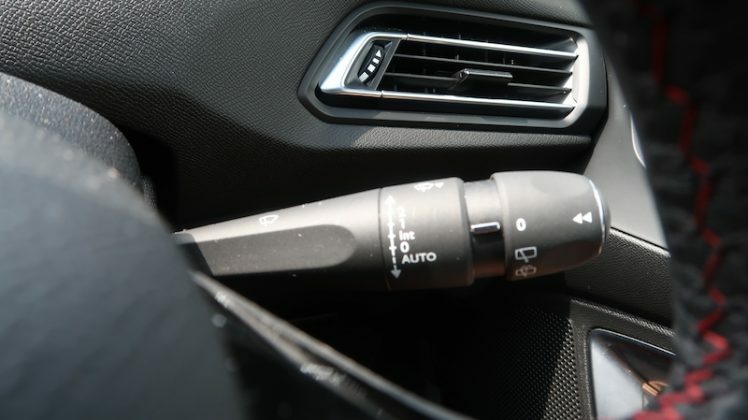 Not only does it have a smaller than normal engine, but it also have a smaller than normal steering wheel, too. Now as you may know, the French brand states that this is so that you can see the dials over the steering wheel, rather than through it, and that theory does work, but only if you happen to be the right height. It’s acceptable for me, but not overly ideal. The theory all depends on you preference for driving position as well, for what it’s worth. This gives you an idea of my view. 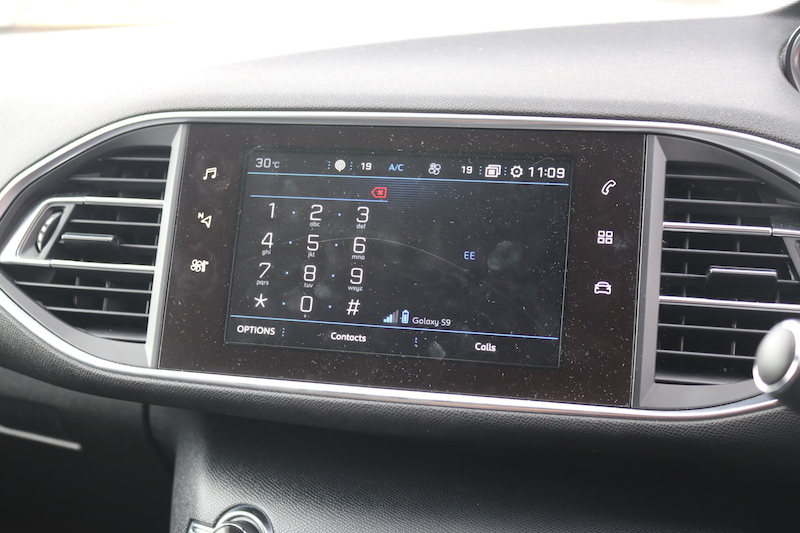 It’s not awful, but the bottom of the display is cut off. 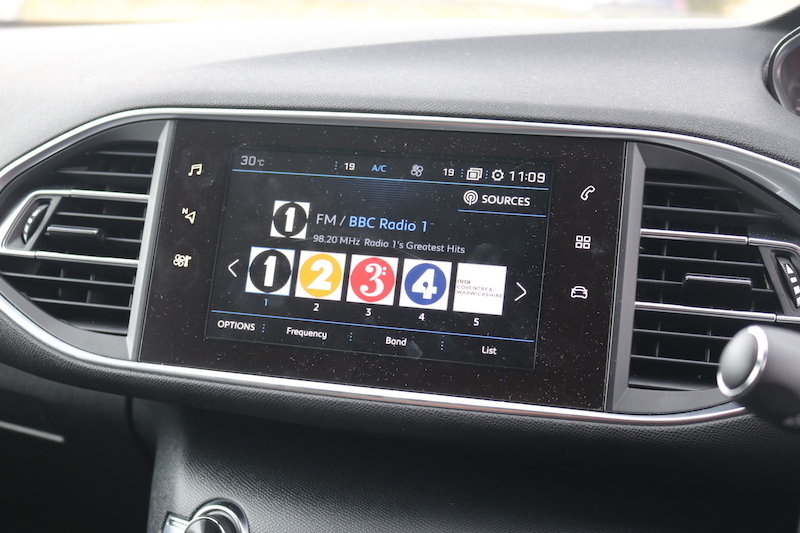 Whilst I’m talking about areas of the car I’m not keen on, the touchscreen is fiddly to use, the dials on the steering wheel can be a bit temperamental, and the car emits an insanely annoying noise when you open the door with the parking brake disengaged. 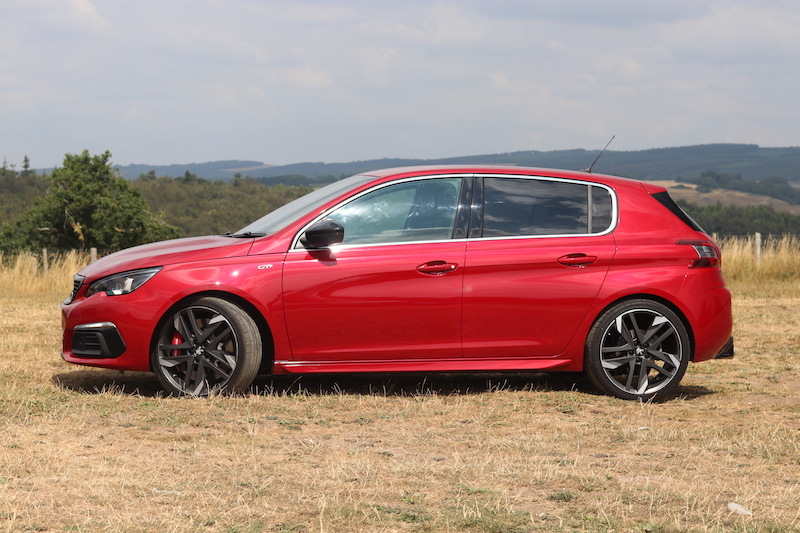 So overall, it seems as if the 308 GTi is yet another fast Peugeot that hasn’t hit the mark. Well not so fast, as there is one button, that changes everything. 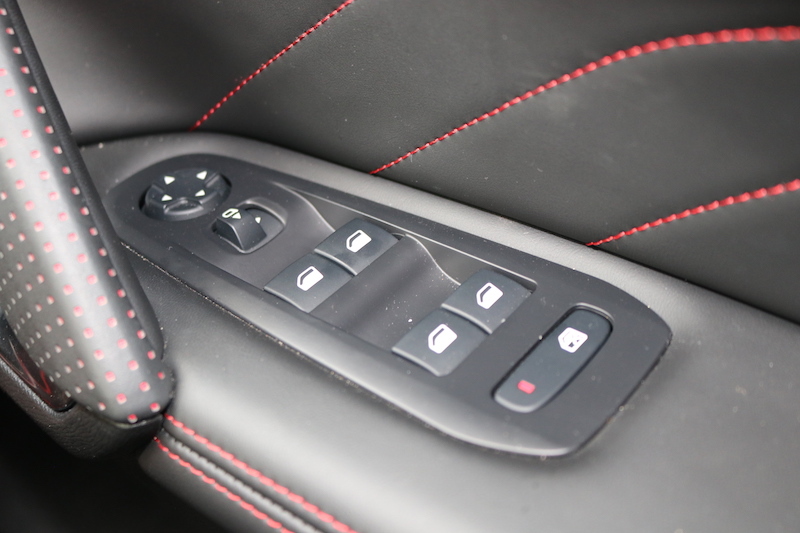 In Sport mode, the 308 GTi feels alive, it feels like you’ve woken a dragon up from its slumber. The non-vocal engine finally finds a voice, although the sound is pumped in to the cabin, which some may dislike, but I’m quite a fan of it. 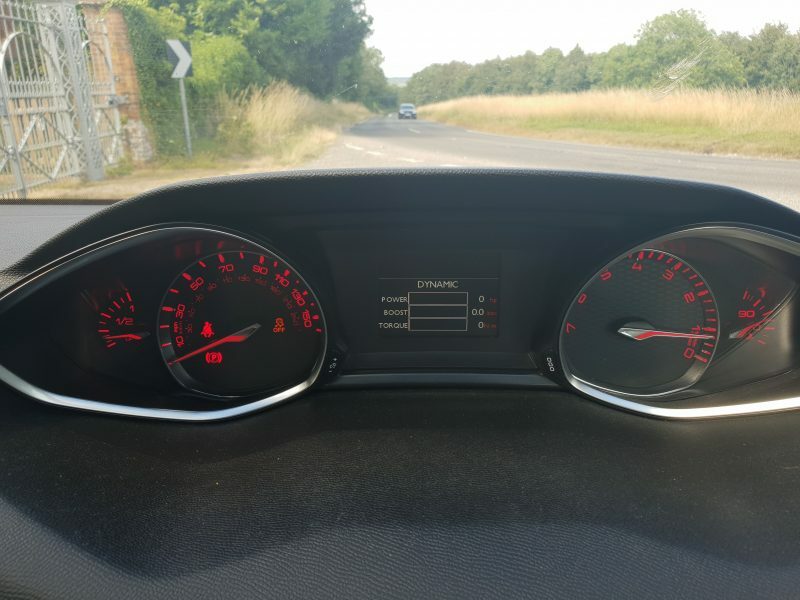 The dials glow a vibrant red, which is welcome, although it does mean that you can’t really see the redline, because, well, it’s all red. 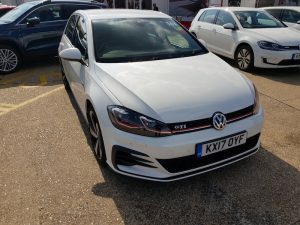 As you would expect, the throttle becomes more responsive, plus the steering gets heavier as well, meaning the GTi finally feels like it’s got its dancing shoes on. So, let’s show it a few corners and see whether or not it’s got two left feet. This is a rather grippy thing! 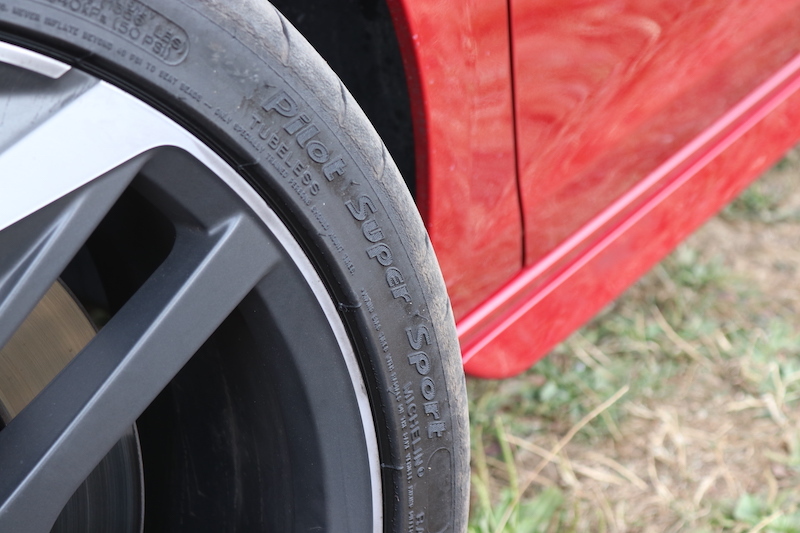 At this point it’s worth mentioning that as standard, you get a limited slip differential, and 19” alloys wrapped in Michelin Super Sports tyres, meaning that you get plenty of grip in the corners. The steering isn’t quite as talkative as you would like, but boy is it direct. The car feels nimble, too – and it ought to as it weighs just a smidge over 1,200, making it lighter than its rivals. 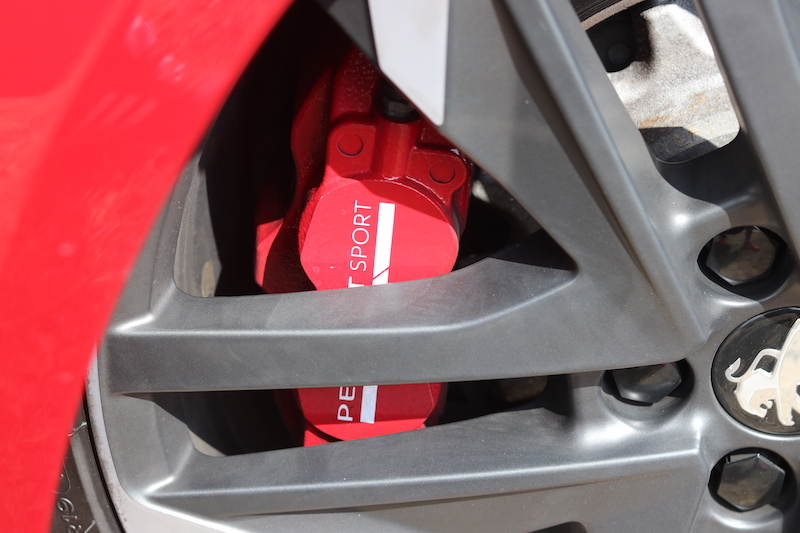 The brakes also deserve a special mention as they are simply brilliant, and they are able to inspire a high amount of confidence. 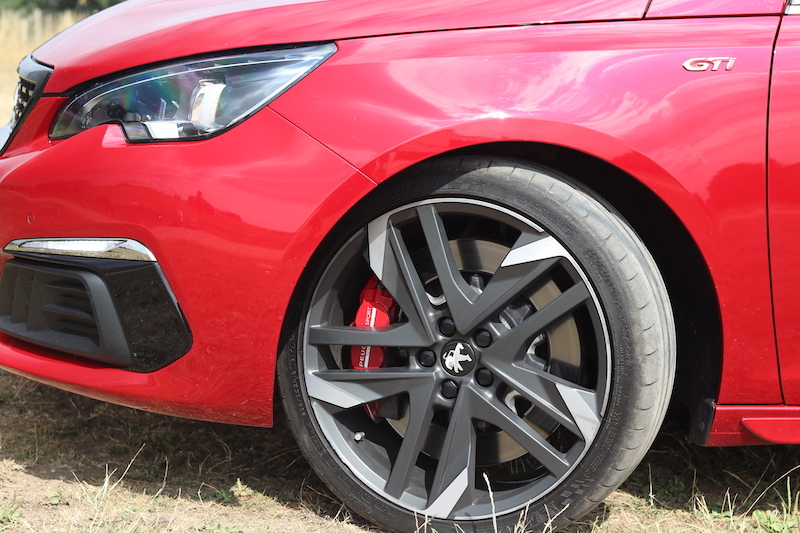 At the front you have 380mm discs with bold red calipers featuring four pistons, and at the rear you have discs measuring 268mm. 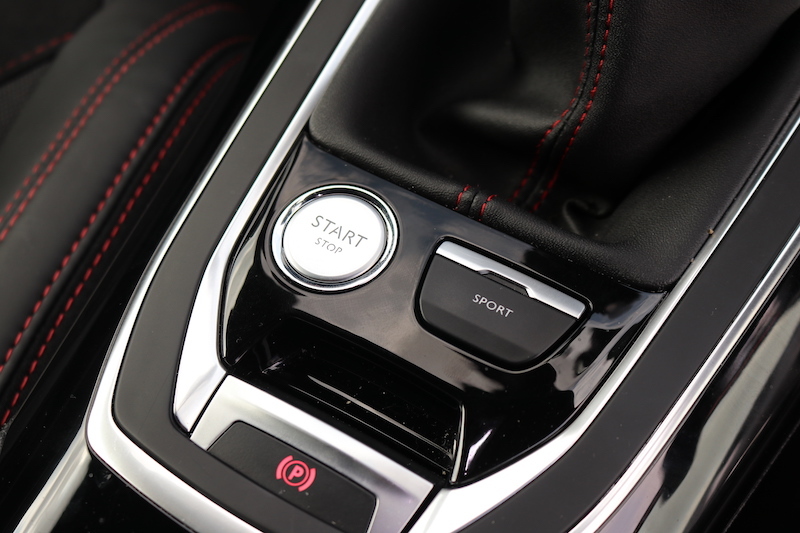 There is a good feel through the brake pedal, and it’s a doddle to know just how much you need to modulate it. Peugeot has done a great job here. These brakes work. Very well. 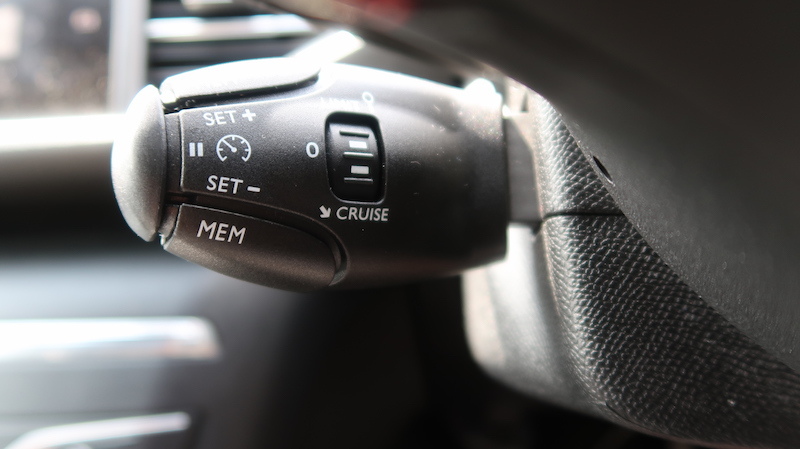 It’s certainly a competent tool for getting around corners, although you will feel the steering tug a little when you accelerate on rougher surfaces, but it’s nothing alarming. 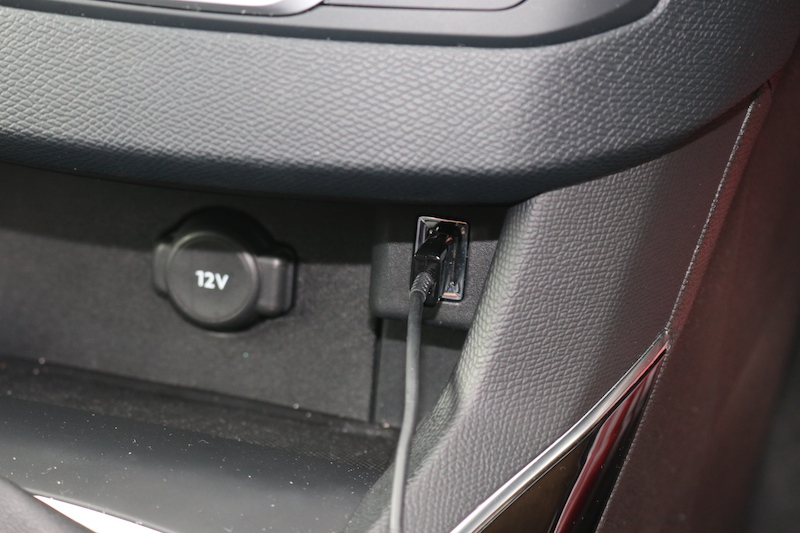 If anything it just makes the car feel a bit more alive and engaging. 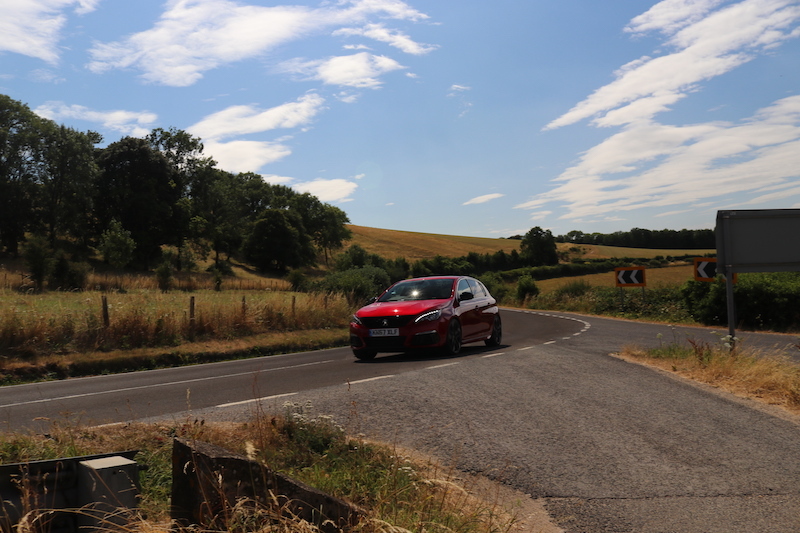 You can also feel the LSD pulling you around the corner, and you’ll really need to pushing before you provoke any understeer worth noting. 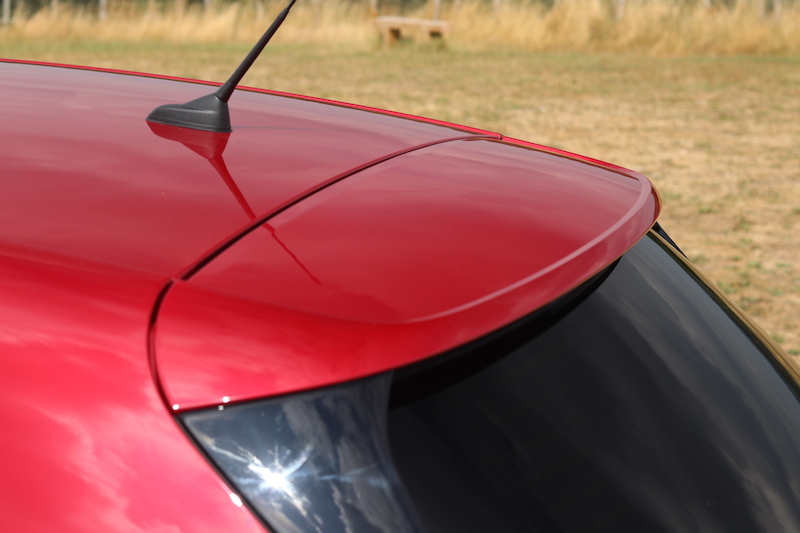 Let’s talk practicality – I know it’s not the sexiest subject, but this is a hatchback after all, so it still needs to be able to do the boring, but important day-to-day stuff. The boot is more than generous, offering 470 litres, making it one of the biggest in class, which can be extended to over 1,300 litres with the 60/40 rear seats folded down. The only downside is there is quite a pronounced lip. 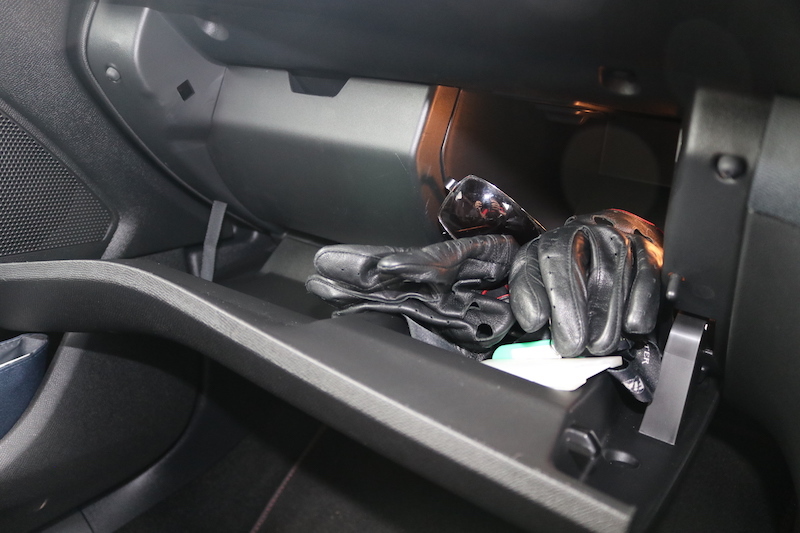 A smartphone fits in this cubbyhole quite well. 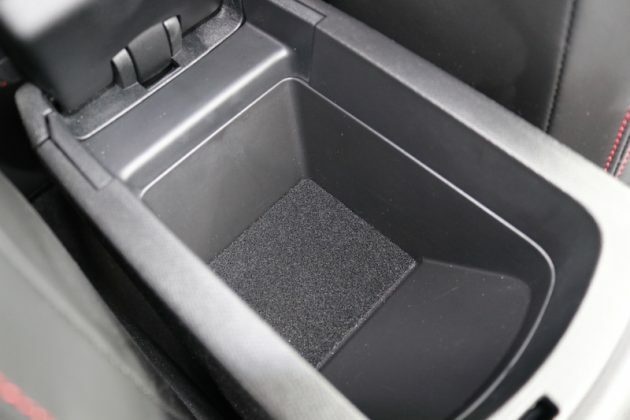 The doorbins are a decent size, but a dedicated cupholder would be nice. 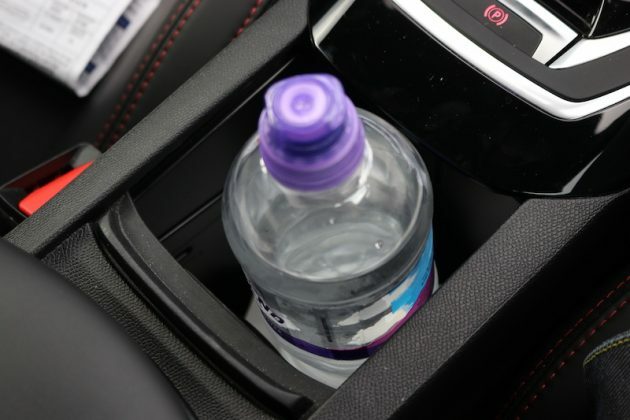 You can put a bottle in the middle compartment, but it's not a perfect fit. 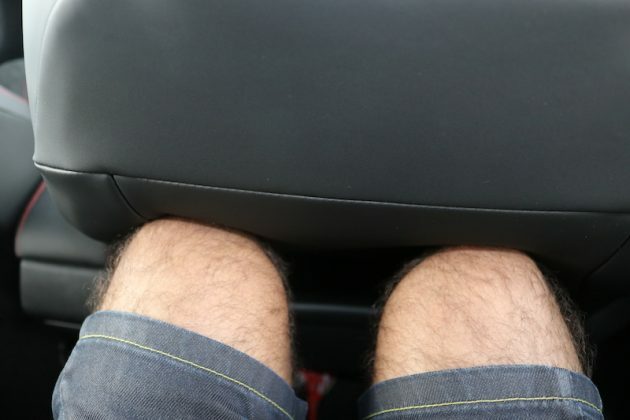 Legroom will definitely be on the tight side for taller occupants. Headroom isn't much better either. 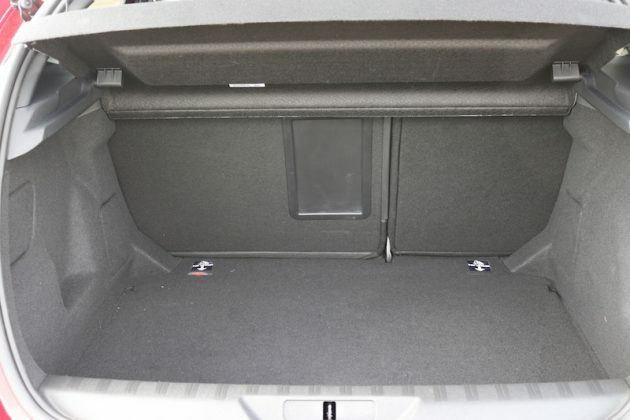 The boot is able to offer more space though, offering 470 litres. This makes it one of the biggest in class. Fold down the 60/40 rear seats, and you'll be greeted with over 1,300 litres. 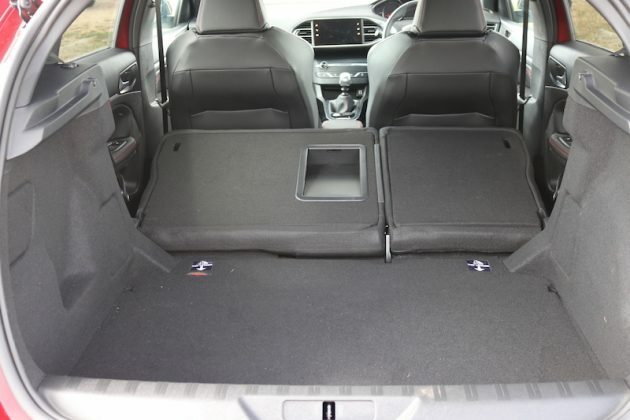 The back seats are more cramped than you may expect though, meaning that it won’t be a great place to be for taller passengers, although smaller adults and children will be fine of course, and there are the obligatory ISOFIX points. 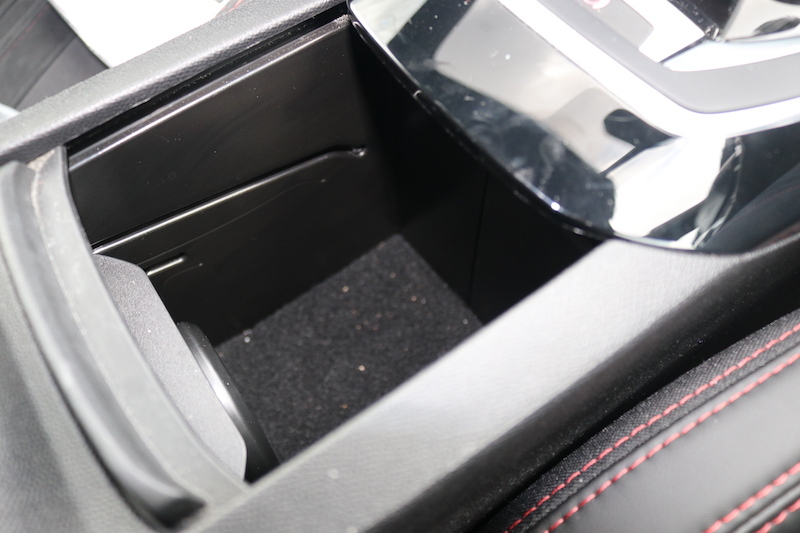 There’s a decent amount of cubby holes in the cabin, but it would be nice to have some dedicated cupholders, rather than having to improvise, plus the glovebox is rather small. 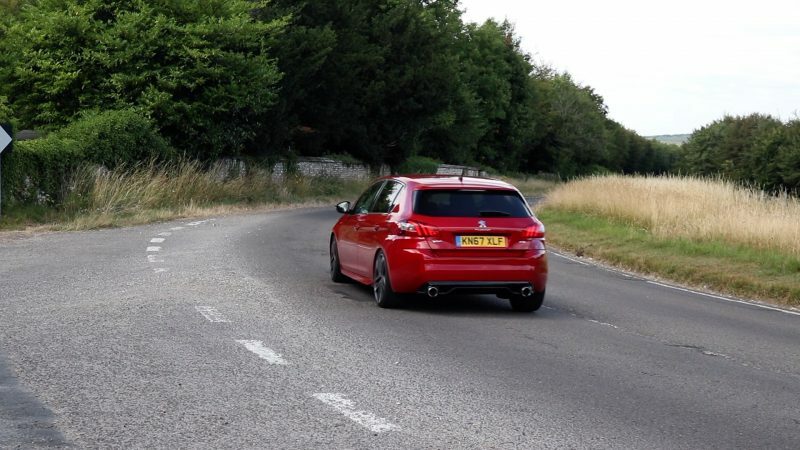 Hot hatches are also about offering performance that won’t break the bank, so how does the 308 GTi fare? 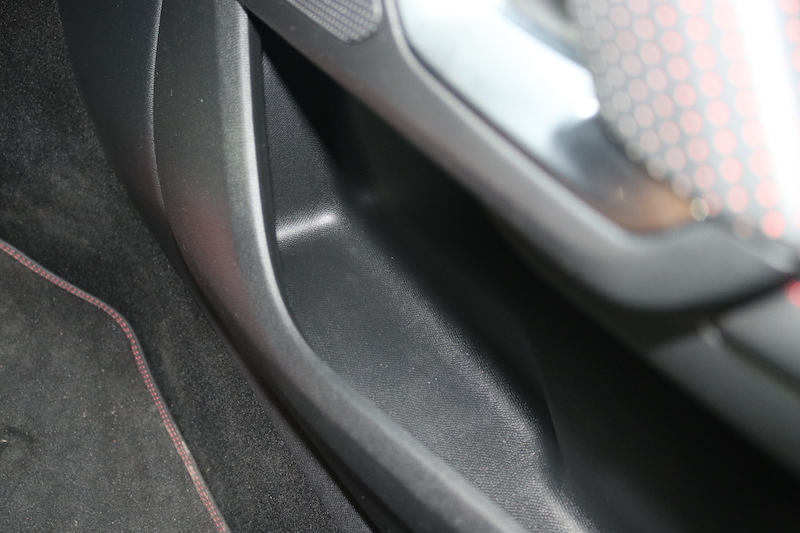 At a starting price of £29,050, it’s not the cheapest offering this corner of the market, and you’d be able to get an i30N Performance and get around £1500 back in change, which is not be sniffed at. Mind you, the German GTI is about £1500 more, so it’s not the most expensive in its class. 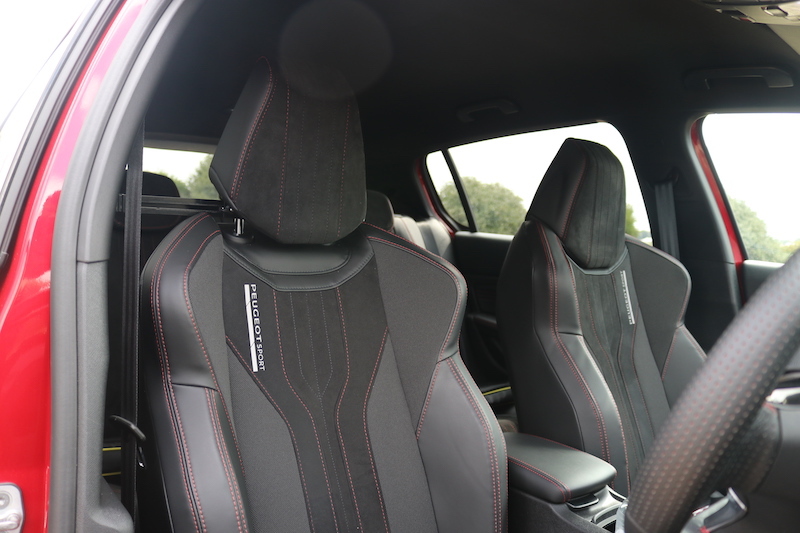 The 308 GTi offers a fair amount of kit. ...and rear parking camera. 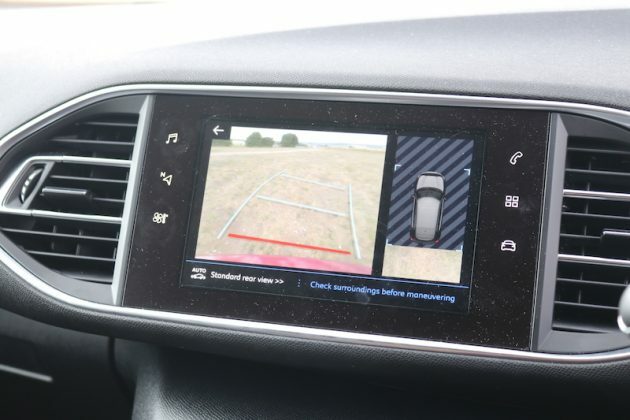 There's also front and rear parking sensors. ...which are lit by LEDs. 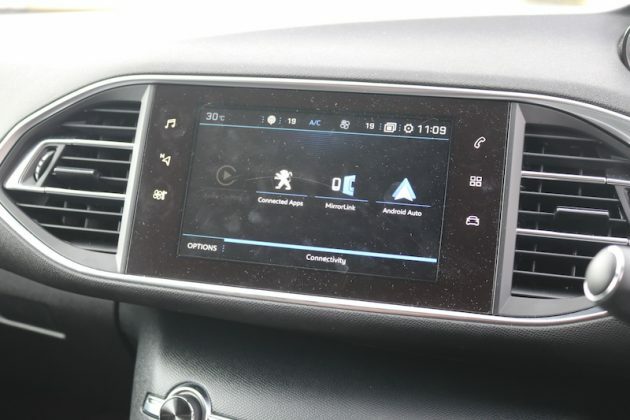 ...even have a massage function! 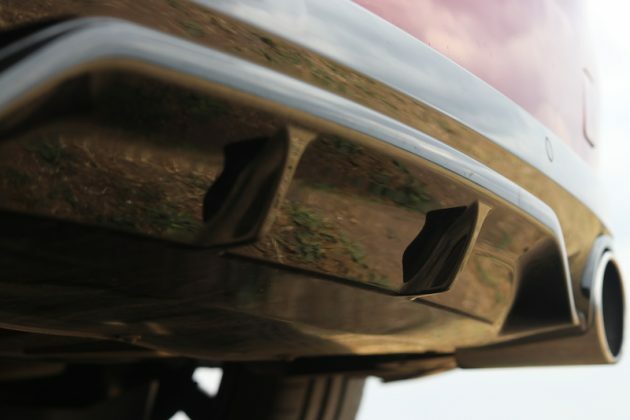 As standard, you’ll receive 19” alloys, two satisfyingly sized exhausts, limited slip diff, GTI front bucket seats with massage function, 9.7” touchscreen, full LED headlights, smartphone connectivity, dual zone climate control, keyless entry, plus much more. 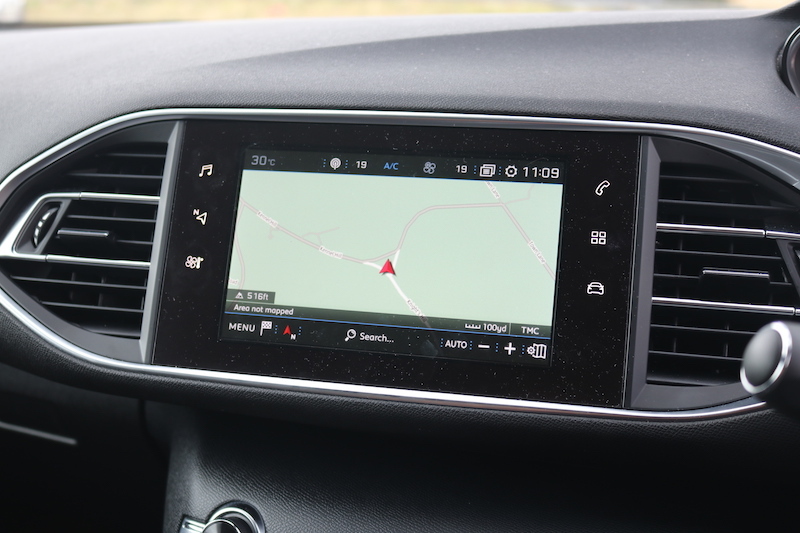 There’s also a good host of safety features, meaning that this car has been awarded 5 stars from Euro NCAP. The model tested here is £29,725 though, as it’s got the optional ‘Ultimate Red’ paint (£675), which looks great in the sunlight. It shouldn’t cost you too much to run either as it’s able to offer over 47mpg on a combined run, thanks to its smaller displacement. I know that fuel economy is unlikely to be a priority for you, but I’m sure you’ll be please that you won’t be spending more time filling the car up rather than driving it. It’s pretty kind to polar bears too, as it emits a reasonable 139g/km of CO2, meaning you’ll pay a respectable £205 for the first year of VED. So, let’s go to my original question – is the 308 GTi a return to form. Yes, I really think it is. 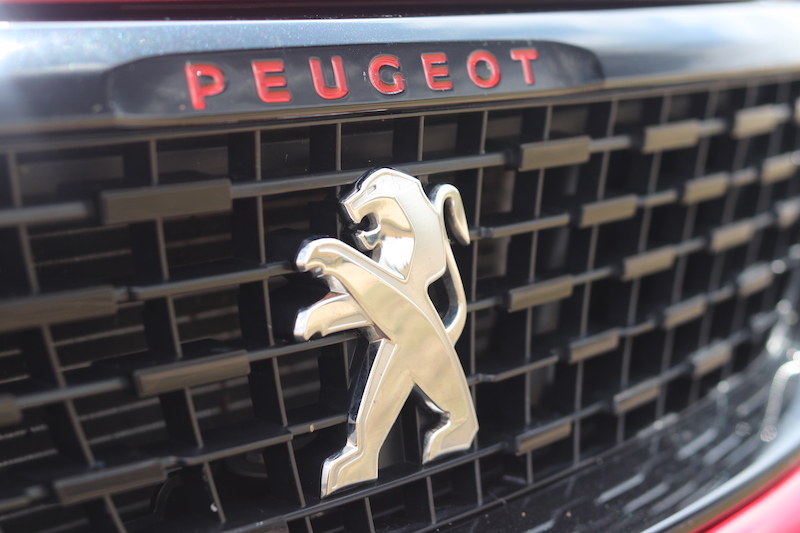 Sure, it’s got a few quirks, and when all is said and done, it’s not the best car in class, but I really do believe it’s a valiant effort from Peugeot. 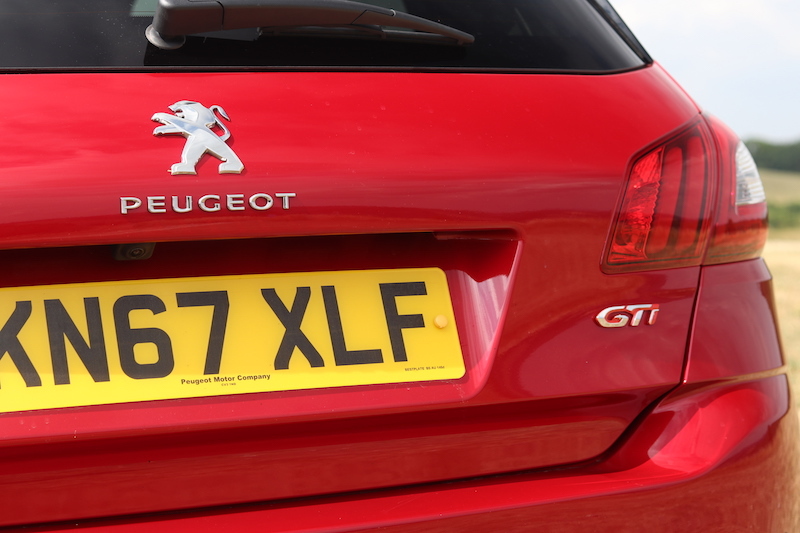 It’s stylish, fast, comfortable practical…ish, it won’t cost the earth to run and it’s able to put a smile on your face – what more do you want from a hot hatch? 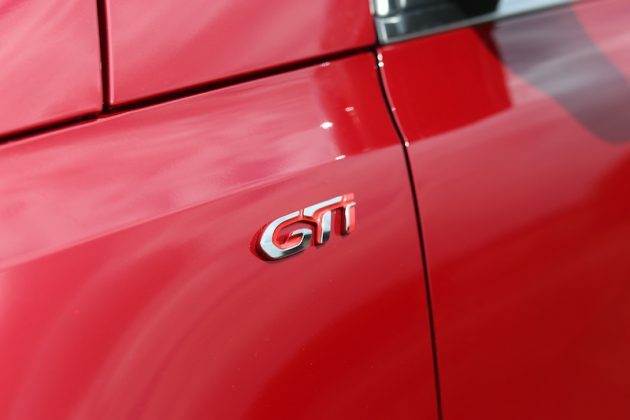 It almost goes without saying that the French GTi’s biggest rival will be the one offered from Germany – the Volkswagen Golf GTi. 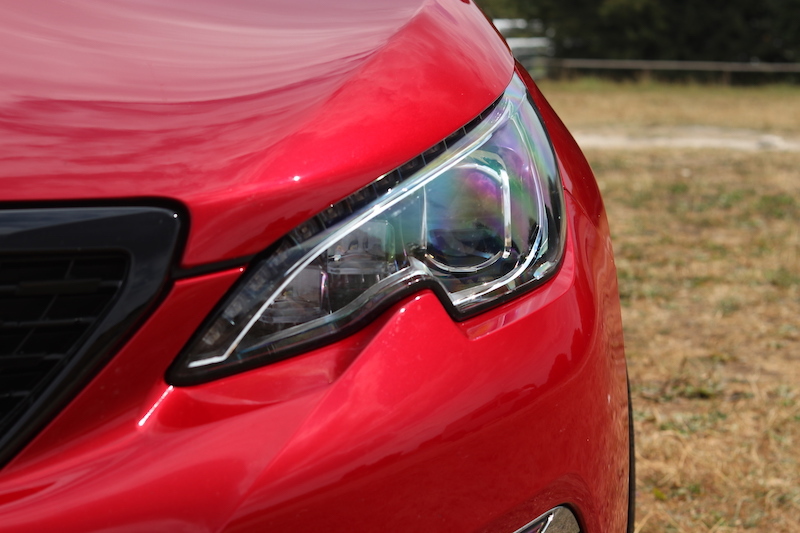 For many, this car is a byword for hot hatchery, and for good reason as it’s able to tick so many boxes. However, it’s not quite as fast, plus it’s more expensive. 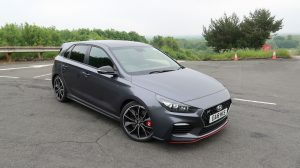 The Hyundai i30N has been a real barn-stormer in this segment of the market, and the Performance model highlights that face even more. Not only is it cheaper than the 308 GTi, but it also offers a wee bit more power. Mind you it’s not quite as fast as the 308 to hit 62mph, but will you notice the difference in the real world? Unlikely. Looking for something a bit more track biased? 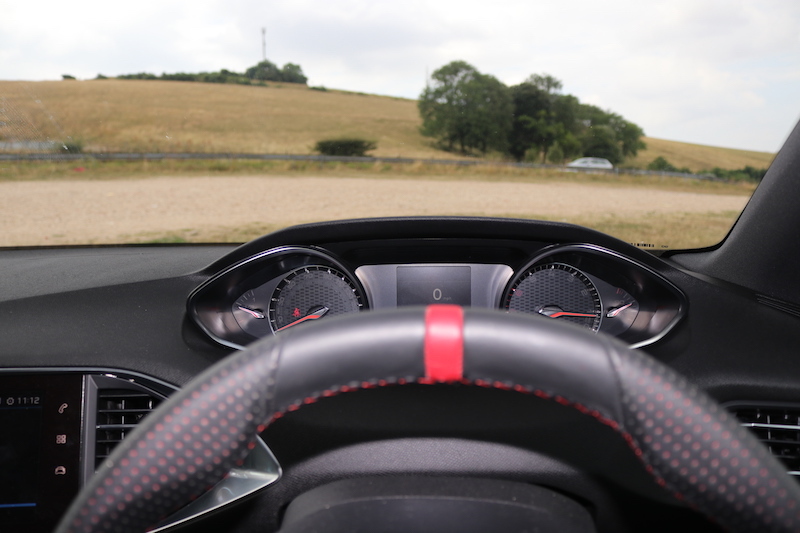 Then you could take a look at the Renault Megane RS, which is not only cheaper, but faster. It’s also a fine looking motor, and it’s able to offer technologies such as four-wheel steering for better cornering and stability. You can also now have the Trophy pack to make it even more of a track weapon.